DIPA – The Barley Whine Hop Juju. Regarded by locals as a world-class DIPA, as exceptional a double as Headhunter is a traditional IPA. Hype was palpable. The second beer is old-school as far as the imperial IPA scene goes. Having been released in 2005 as a hop bomb with 98 IBUs and a massive ABV of 12%, it represents all the brashness and swagger of the team at Dark Horse. So how did the two hoppy beers compare, and which one won the battle? First up was the paler of the two, a semi-translucent— wouldn’t call it cloudy— copper pour with thick white head. As the original Batman show would say: BAM! KAPOW! BOINK! This beer has a massive piney hop nose with undercurrents of citrus, plants and a hint of malt. The taste is even bigger, with a huge grapefruit/citrus element, balanced somewhat by a cracker malt flavor. The body is medium with solid carbonation. Finish comes in with big bitterness, even more hops, and a dryness. What a beer! Hop lovers are always told that every double IPA with major bitterness is right up their alley. In this case, Fat Heads delivers the goods with an amazing beer from hop crazy nose to thirst inspiring dry finish. A 2013 Great American Beer Festival gold medal winner, Hop Juju shows what a world class double IPA can be. The team up at Dark Horse are known for taking chances on beer. For their imperial IPA, they went literal in this persuit, doubling the malt bill and hops, while keeping the water at the same level. From this description we might expect a near barley wine level of malts. With 98 IBUs and an ABV of 12% this thug is bringing all his swag to the party. Pour is ruddy orange/copper with some haze. The head is thin, khaki-orange, and dissipates quickly. The nose is caramel malt with medicinal phenols and a distinct scent of booze. The body is medium, feeling heavier due to the weak carbonation. Tasting this thing is much like the smell: caramel malts, a plant-like note, bitterness from the hops, and alcohol. 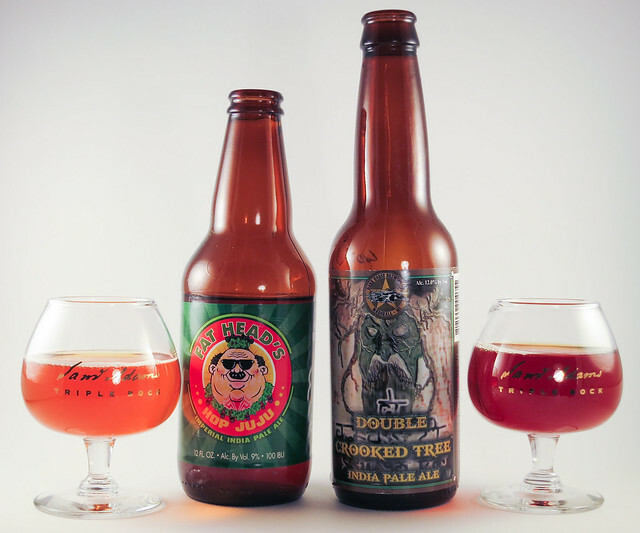 Double Crooked Tree is very sweet, reminding one more of an American barley wine than an IPA. Finish is bitter and booze-forward. In this battle, I expected to huge delicious imperial IPAs. The results proved us half right. Dark Horse brought a malt loaded booze bomb, that seemed designed to cover up the hoppy high IBUs. The new Fat Head’s beer was closer to what was hoped for, a beer striving for the superlative heights of double IPAs. Superbly flavorful, but actually achieving a good balance between the juicy citrus hops and malts. The winner then, is Fat Head’s Hop Juju by knockout in the first round. Even if older double IPAs left too bitter or malty a taste in your mouth, this one will not disappoint. Note: For this review, Dave and I are combining forces once again, this time for a simultaneous review, both from the mainland, and on a tropical isle, connected via the audio of long distance cellular telephony. The cans are from the same batch, about 4 weeks from the cannery at the time of our tasting. Now for the writing about beer. To talk about Heady Topper, we first need to talk about Tropical Storm Irene. When this squall blew through Vermont in 2011, many businesses were heavily damaged, including John and Jen Kimmich’s Alchemist Pub & Brewery in Waterbury. Financially strapped already from the recent building of a cannery, the Pub was ultimately abandoned, and the cannery repurposed as Alchemist Brewery. What was a loss to the Waturbury residents in terms of nightlife, was a windfall for beer lovers everywhere. With FEMA not covering basement property in the downtown, the old brewery could not be recreated in such a high risk location. Instead, The Alchemist Brewery was reborn at the cannery location atop a nearby hill. They started brewing their flagship double IPA Heady Topper in 10 oz cans. The beer has proved so popular that despite increasing production, have not been able to brew enough to meet demand. It seems people can’t get enough Heady, or other Vermont beers like those from Lawson’s Finest and Hill Farmstead. Having visited Vermont a few years back, when loading the cabin up with local beer essentially meant Magic Hat # 9, we can attest to how the quality and variety of Vermont beers have increased. And the buzz about these new craft brewers has spread beyond the granite state. So much so that the local beers are now some of the most valued trade commodities within the craft beer community, with Heady Topper topping Beer Advocate’s oft-cited ‘Top 250 Beers’. So is the best beer in the world something canned from Vermont? Let’s pour it out and find out. The Alchemist brews Heady with 6 hop varieties, coming in at 120 IBUs, and 9% ABV. In their words: “This Double IPA is not intended to be the strongest or most bitter DIPA. It is brewed to give you wave after wave of hop flavor without any astringent bitterness.” So the promise is all of the hop flavors and aroma many love, with less of the bitterness that can turn some palettes away from IPAs. Dave: Looks like a wheat beer, unfiltered and cloudy. Big hop profile in the nose, minor biscuit malts as well. Taste is all hops, tropical fruit with pine, not Bubblicious gum. There is a graininess with some hop solids present. The finish has dryness from the 8% ABV that makes you want more. The yeast here may be helping make this so balanced. Could drink a lot of these, which might be dangerous. Would rather session a Zombie Dust, but this is a great highly hopped DIPA. Steve: The pale gold color is clearly murky and unfiltered, reminding me of an IPA that sat too long with some floaties. Aromas are minimal in the can, but from the glass there are citrus hoppy scents, and some malt. Flavors are initially a surprise. The hops are there but there is much less bitterness you would expect to pair with the aromatic pine/tropical fruit notes. There is a significant malt backbone as well, not quite enough to call this sweet, but certainly it is less bitter than many DIPAs. Bell’s Hopslam comes to mind here: big hop presence with minimal bitter bite and a well hidden high alcohol content. But where that beer uses honey sweetness to balance the big hops, which still eventually build up, Heady seems to simply be devoid of most astringency. The body is significant and as Dave said, grainy, with that dry finish that tempts you to take another hop-centric sip. 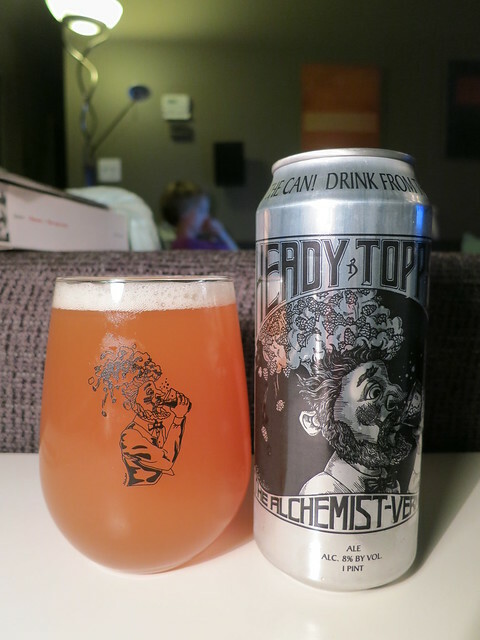 Having sampled Heady Topper in both the can and a glass, we both feel this beer is one great double IPA. The issue of the can providing the best experience is less clear. If you are going to be sitting around in the sun drinking Heady, the can is for sure the way to go, it will be protected from the elements of light, and air, as well as have a nice insulation. However, if you are indoors, drinking such a delicious ale, these beer is not going to sit long in your glass, and you will not only get a great taste, but all that wonderful aromatic hop ecstasy in the nose. In either vessel, does this compromise the BEST BEER IN THE WORLD however? To us it doesn’t quite reach that level. The amazing work done to remove the bitterness in big IPAs has a downside. There are flavors in those huge more astringent DIPAs, where the bitterness matches other flavors, such as Pliny the Elder, Abrasive, or even a lower lower ABV beer like Zombie Dust. For me, with all the complexities available to brewers with yeasts, barrels, and exotic adjuncts, no IPA is likely to be my top beer. That said, this amazing beer is certainly near the top in terms of sessionable DIPAs, incredibly enjoyable hop experience even for those beer lovers that shrink from bitter beer. Pick up a few the next time you are in Vermont. Hoppy 4th of July! 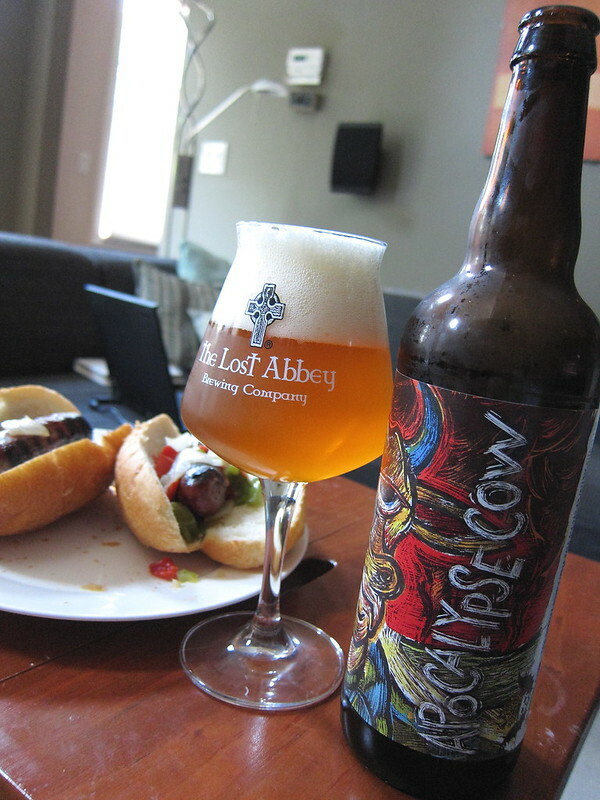 For this special holiday review we take sample Three Floyds Apocalypse Cow. A double IPA , Apololypse Cow is one of many hoppy brews from from Munster Indiana’s Three Floyds Brewing Company. Hop forward beers like Gumballhead, Alpha King, Zombie Dust, and another DIPA, Dreadnaught (9.3%ABV / 99 IBUs). All delicious examples of some of the best hopped beers in the world. Three Floyds has won Best Brewery in the World from RateBeer.com 5 of the past 6 years for good reason. These beers are consistently superlative. So how about another double IPA in the lineup? Can it compare to the Dreadnaught or other world-class double IPAs? To start, it differs from its sister beer the Dreadnaught primarily by the addition of lactose milk sugar. This gives a creamier body in the same way a milk stout is smoothed over. But what will that do to an IPA? Enough prologue, let’s taste this bovine! A big citrus nose flows out of the frothy headed, amber colored ale. Amazing grapefruit and tangerine assault the palate immediately, followed by bread-y sweet malts covering up most of the 11% ABV. Going down the hatch with brisk carbonation you get a cheek pinch of bitter hops, lemon and some faint ethanol burn. This is a flavor explosion of citrus and floral hops, sweetness, booze, wrapped around the slick body! Drinkability is far too high for such a boozy brew. Compared to 3 Floyds’ other DIPA, the Cow has more body and sweetness, complexity and finishes at least as bitter. The Apocalypse Cow is a seasonal release for June. It just appeared at my local bodega and I’m guessing it won’t last. If you like Bell’s Hopslam, Dogfish Head 90 minute IPA, Great Lakes Lake Erie Monster, or any big IPA, give this a try. You may have a new favorite hop bomb.